I came to the nation of Georgia in 2001 as an undergraduate with a fellowship that consisted mainly of the idea of going to Georgia. My fellow students and I didn't know the first thing about the country, its history, or its politics. In just a few years, Georgia would be making news on the world stage, And a massive increase in foreign investment would bring many foreigners to its capital, Tbilisi. But at the time, we would turn heads wherever we went, at times even causing grandmothers sweeping the sidewalk to freeze and gape. The civil wars of the 90s were still very fresh, and the government in power under Edward Shevardnadze was aimless and corrupt. Each week seemed to bring new stories of violence, sometimes involving close friends. The largest hotel in the city was spilling over with refugees. Against this backdrop, the shiny new McDonald's in the center of town seemed almost comically out of place. 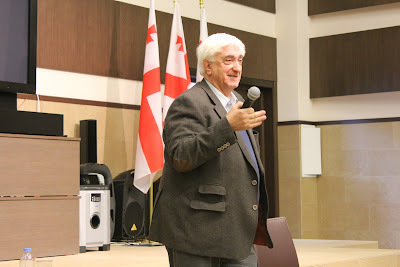 One of the first places my program leaders took us was to the Georgian Foundation for Strategic and International Studies (GFSIS), to soak up its director Alex Rondeli's perspective, warmth, and gravitas. We arrived in the afternoon, after everyone else had left, and stayed into the evening, listening to him talk and asking him questions. We immediately felt connected to something bigger than our fragmentary glimpses of Georgia. We had no idea who this grandfather was, but he patiently and generously laid out his understanding of the world and George's place in it, answered all of her questions and asked us some of his own. There couldn't have been a better introduction to Georgia. Years later, I returned to the country after its peaceful revolution in 2003 to work, clumsily, for new president Saakashvili. By then, Alex had become a critic of the direction the president's party was taking, mild compared with many public figures but with much weight behind his disappointment and scolding. Within the presidential chancellery, I hardly ever heard talk of the widespread disaffection of most citizens, aside from the odd eye roll at the often comical opposition politicians. The one person whose disapproval seemed to really matter was Alex. When he didn't support you, even if you were the most powerful person in the country, it hurt. Thanks for the inspiration for this to Mark Mullen, who wrote a beautiful eulogy.